Verizon's first LTE phone? Motorola's dual-core, 4.3-inch Droid Bionic. Verizon’s first LTE phone? Motorola’s dual-core, 4.3-inch Droid Bionic. Of course, to top off all of these lovely features, you’ll also have the ability to run everything at blazing fast LTE speeds — if you’re in an area that is covered. Oh, and you’ll have to wait until at least April before getting your hands onto one. The closest that we have to a definitive date is “second quarter”. There’s also been no pricing set, but you can almost bet that the typical $199 on a 2-year contract will continue. 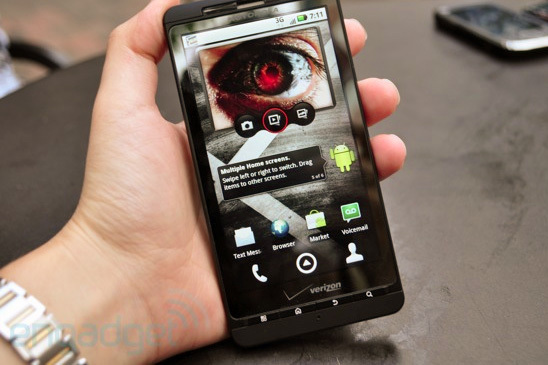 From the looks of things, the Bionic is a rework of the wildly-popular Droid X. With the gigantic screen and similar high-quality display, the Bionic looks more like a refresh than something entirely new. What remains to be seen is the true advantage that LTE will bring to a mobile phone experience. Will the Bionic change our mind about the X being Verizon’s best phone? We’ll have to wait until we get our hands on one, but we’ll let you know soon.